Touchdown in Auckland and it’s all turbulent skies and rain. But it’s mid-winter and still 14 degrees – not to be sniffed at folks. We’re staying at the Sebels Suites and it’s been a great welcome (wee Amy at reception is such a treasure). It’s really a ‘couples’ kinda place designed for intimacy – heaps of mood lighting and tastfully furnished with elegant quality floor-to-ceiling drapes, table lamps galore…you get the picture. 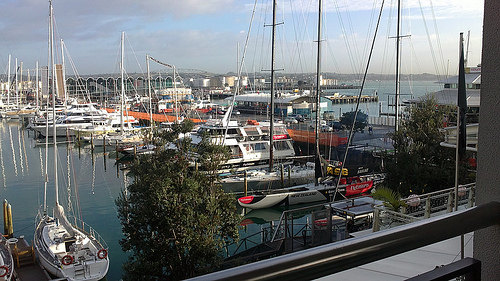 We stand on our private balcony and quietly toast Auckland’s magnificent harbour lights. I’m not allowed to sit on my big fat laurels for too long. We plug in the laptops then on with our coats it’s downtown for food-on-the-run. I’m not dressed appropriately for a Food Hall, but Michael insists we experience the full range of dining options for the traveller. This attitude NEVER gets my seal of approval, but the upside is that Asian food courts are great for people watching and I love Asian food. We’ve come across a specialty handmade Chocolate shop (it’s such a bonus when your partner loves this stuff!!) The Whisky & Raisin truffle barely touches the side. Michael considers forcible restraint, sees the steely glint in my eye and backs off. It’s back to the hotel and more champagne. I’m feeling a bit squeamish. Michael’s busy texting a client in India while the yachts on the harbour sway to the beat of a strong westerly. Someone refill those Champagne flutes! It’s the people on these small group tours that I always remember the most (never had a ‘dud’ yet). We’re sharing the Bush-and-Beach tour bus with a couple from Finland and the USA plus a lone Brit. What a great combo! Anthonie, our tour guide has a degree in History and there’s nothing he doesn’t know about New Zealand, let alone the Auckland region. He includes in his full commentary some really quirky stuff like when a lemon tree and a Norfolk Pine were always planted with every state house being built in the 1920’s & 30’s. His Maori pronunciation of names is impeccable. We drive out of the city, pass the Waitakere Ranges – heaps of laughs on the way. 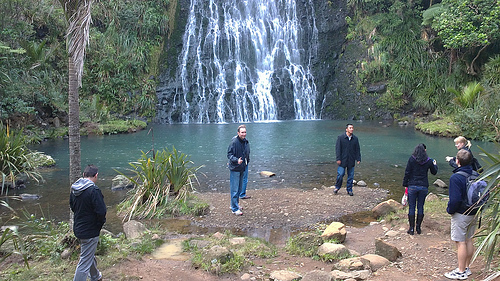 The majestic waterfall at Karekare is truly the stuff of great memories. You may disagree, but after a shaky start, I think I’m finally getting the hang of taking photos. Just wish Michael would stop barking out instructions in front of everyone! Piha is beach is memorable, not only cos I get to see where Anna Panquin did her cartwheels in ‘The Piano’ film, but because Anthonie quietly informs us that he’s never seen the surf so close to shore. Before I get too worried, we’re whisked away from the Beach to begin our bush exploration. We’re informed that New Zealand became an Island ruled by birds and that Auckland has an abundance of native bush. I quietly gave thanks there’s no test at the end of the tour. 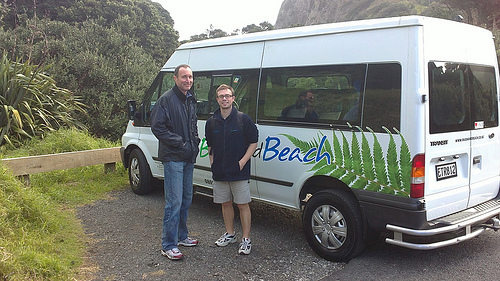 Anthonie saved the best to last, bless him – our last stop to view a mighty a 1000 year old Kauri tree. Lasting impressions.